As we've written about on numerous occasions, multiple 2020 Democratic presidential candidates, and nearly half of the House Democratic caucus, have endorsed single-payer healthcare. We often critique this government-supremacist model through the lens of the astonishingly large, across-the-board tax increases that would be required to foot the accompanying $3.2 trillion (at minimum) annual bill -- noting that this would explode the federal budget by roughly 80 percent, above and beyond the deficit-addled status quo. We also point out that both primary pieces of legislation on this front (Bernie Sanders' bill and the House version) would effectively outlaw the private insurance plans relied upon by nearly 180 million Americans. Republicans got a lot of political mileage out of attacking Obamacare's broken "keep your plan" pledge, and Democrats exploited estimates showing that GOP replacement plans would separate millions from their new coverage. Single-payer healthcare would rip plans away from more than half the country, impacting every single person who gets his or her coverage through their employer or directly through private insurers, the vast majority of whom are satisfied with their existing arrangements. Thousands of elderly people in Britain are left to go blind because of rationing of eye surgery in the National Health Service (NHS), a report revealed on Saturday (April 6). The Times newspaper said a survey by the Royal College of Ophthalmologists (RCO) found tens of thousands of elderly people are left struggling to see because of an NHS cost-cutting drive that relies on them dying before they can qualify for cataract surgery. The survey has found that the NHS has ignored instructions to end cataract treatment rationing in defiance of official guidance two years ago...Julie Wood, CEO of NHS Clinical Commissioners, which represents local funding bodies, defended the restrictions. She told the Times: "NICE guidance is not mandatory and clinical commissioners must have the freedom to make clinically led decisions that are in the best interests of both individual patients and their wider local populations. 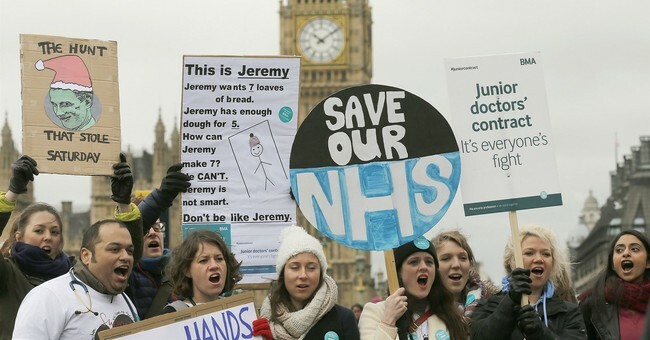 The NHS does not have unlimited resources." Nearly a quarter of a million British patients have been waiting more than six months to receive planned medical treatment from the National Health Service, according to a recent report from the Royal College of Surgeons. More than 36,000 have been in treatment queues for nine months or more. Long waits for care are endemic to government-run, single-payer systems like the NHS...Consider how long it takes to get care at the emergency room in Britain. Government data show that hospitals in England only saw 84.2% of patients within four hours in February. That's well below the country's goal of treating 95% of patients within four hours -- a target the NHS hasn't hit since 2015. Now, instead of cutting wait times, the NHS is looking to scrap the goal. Wait times for cancer treatment -- where timeliness can be a matter of life and death -- are also far too lengthy. According to January NHS England data, almost 25% of cancer patients didn't start treatment on time despite an urgent referral by their primary care doctor. That's the worst performance since records began in 2009. And keep in mind that "on time" for the NHS is already 62 days after referral. British cancer patients fare worse than those in the United States. Only 81% of breast cancer patients in the United Kingdom live at least five years after diagnosis, compared to 89% in the United States. Just 83% of patients in the United Kingdom live five years after a prostate cancer diagnosis, versus 97% here in America...Patients face long wait times and rationing of care in part because the NHS can't attract nearly enough medical professionals to meet demand. At the end of 2018, more than 39,000 nursing spots were unfilled. That's a vacancy rate of more than 10%. Among medical staff, nearly 9,000 posts were unoccupied. These shortages could explode in the years to come. In 2018, the Royal College of General Practitioners found that more than 750 practices could close within the next five years, largely because heavy workloads are pushing older doctors to retire early. The NHS recently announced that, in a desperate attempt to shore up its doctor workforce, it would pay British general practitioners working abroad more than $24,000 in "relocation support" to come back to the country. The Service is also trying to encourage doctors to come out of retirement. I'll leave you with the ever-relevant reminder that when Democrats dress up socialized healthcare as "Medicare for All," Medicare itself is rapidly going insolvent.